High Solids 'one coat' emulsion. Solvent free, environmentally friendly. Dries to a transparent film. Excellent weather resistance. 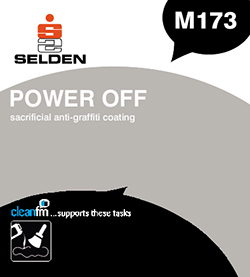 Enables the easy removal of graffiti from brick, stone, porous and painted surfaces. Ideal for external walls, historic buildings/monuments, railway stations and bridges, shops and public areas. Composition A unique blend of water soluble wax emulsions, non ionic surfactants and thickener.